The Legal Genealogist‘s absolute all-time favorite law-related blog is In Custodia Legis, the blog of the Law Library of Congress. Its content is an eclectic mix, with reports on upcoming legal presentations or conferences, a regular pictures of the week feature (the latest was about the King John seal), interviews with the many and varied people who use or work at the library, from former members of Congress to current interns, and more. And when you combine my favorite law dictionaries with my favorite law blog? And that happened last week, when In Custodia Legis reported a development that we as genealogists should welcome with open arms: an initiative by the Georgetown University Law Library in Washington, D.C., to digitize its law dictionaries collection, adding a wide variety of new resources to our digital bookshelves when we need more help understanding just what some pesky legal record really means. Recently, while conducting research in the course of my studies, I learned of a project currently underway at the Georgetown Law Library to digitize their collection of early legal dictionaries. This will facilitate the entry of these rare editions into the public domain and make them virtually accessible. 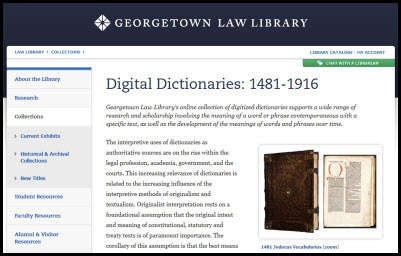 Heading over to the Georgetown Law Library site, you can find the Digital Dictionaries: 1481-1916 collection at this link. The Library says — in fancy language — what I keep saying: when we’re stumped by what something means, it helps to have a dictionary that was in use as close to the time when the record was created as possible. 1641: Sir John Skene, De verborum significatione : the exposition of the termes and difficill wordes, conteined in the foure buiks of Regiam Maiestatem, and uthers, in the acts of Parliament, infeftments, and used in practicque of this realme, and with divers rules, and common places, or principals of the lawes (London : Printed by E.G., 1641). 1824: John Henry Adlington, Cyclopaedia of law Or, the correct British lawyer (London : Thomas Kelly, 1824). 1879: Andrew Wright, (Glossary from) Court-hand restored : or, The student’s assistant in reading old deeds, charters, records, etc… (London : Reeves & Turner, 1879). 1916: James A. Ballentine, Law Dictionary of Words, Terms, Abbreviations and Phrases Which are Peculiar to the Law… (San Francisco : Bancroft-Whitney Co., 1916). So go ahead. Let your inner legal geek out … and geek out in the law dictionaries. I just bookmarked the site. Thanks, Judy. Great site, isn’t it? Thanks to both Georgetown Law and In Custodia Legis! Thanks for your praise of In Custodia Legis! It’s my favorite non-genealogy blog — and one that most people could benefit from reading! !